Buy a set, just the cup, just the canteen, your choice. Cups are military issue, not knock offs. Used Complete CVC Combat Vehicle Crewman's Helmet Kit! Includes the Kevlar Helmet, the removable padded/mesh liner with all communications (BOSE Headset and Microphone comms). Size Medium. 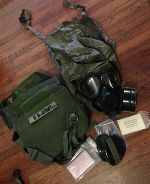 Glenn found some and is selling kits that include: Masks, carry pouch and hoods are used/carried and great condition, outserts/lenses are clear and in good condition, NEW M17A2 filters. Additional NEW filters sold separately, see shopping cart! 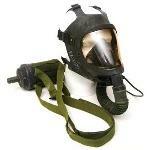 Comes with the mask, size small, hood (not shown in pictures) and unused filter. The mask and hood have been thrown around and carried but are still in good working condition - a bit dusty.